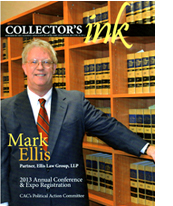 Mark Ellis is nationally recognized as a leading trial lawyer defending creditors, law firms and collection agencies in commercial law litigation, including class actions, arising from the Fair Debt Collections Practices Act (FDCPA), the Fair Credit Reporting Act (FCRA), and the Telephone Consumer Protection Act (TCPA). His expertise extends to California law equivalents of the above federal acts, such as the Rosenthal FDCPA. The law firm acts as Regional Panel Counsel for the Travelers' Insurance Company, which defends collection agency members of the American Collectors Association. Mr. Ellis has also successfully argued numerous cases before United States and California courts of appeal. In 2010, he co-authored with Ronald Zumbrun, Andrew Steinheimer and June Coleman an amicus curiae brief on behalf of the California Collectors Association in Jerman v. Carlisle—only the second United States Supreme Court case to analyze the text and legislative history of the FDCPA. Van Patten v. Vertical Fitness Group, LLC — The U.S. Ninth Circuit Court of Appeals upheld a U.S. district court summary judgment January 2017 in favor of the defendant, a fitness gym, in a Telephone Consumer Protection Act (TCPA) class action. Goodson v. Designed Receivable Solutions Inc — Summary judgment in class action defense October 2016 in U.S. District Court, Central District of California, on behalf of a collection agency accused of violating the federal Fair Debt Collection Practices Act, California’s Rosenthal FDCPA, and the federal Telephone Consumer Protection Act (TCPA). Reddin v. Rash Curtis & Associates — Summary judgment July 2016 in U.S. District Court, Eastern District of California, on behalf of a collection agency accused of violating the federal Fair Debt Collection Practices Act and California’s Rosenthal FDCPA. Abbot v. Experian Information Solutions, Inc..— Motion to dismiss April 2016 in U.S. District Court, Northern District of California, defending Credit Bureau of Placer County, Inc., accused of violating the federal Fair Credit Reporting Act (FCRA), California’s Consumer Credit Reporting Act (CCRAA), and the California’s Unfair Competition Law (UCL). Jones v. CBSJ Financial Corp.—After a mere 25 minutes of deliberations, a unanimous jury rejected plaintiff’s claims under the federal and state Fair Debt Collection Practices Act and entered a complete defense verdict in favor of client. Guiterez v. NCA—This case settled on the first day of trial after motions in limine gutted plaintiff's claims and damages. Pre-trial demand in excess of $1,000,000 settled for less than the cost of defense for defendant clients. Rouse v. Law Offices of R.C.—Tried in the United States District Court for the Southern District of California, this case concluded with a unanimous jury finding in favor of our defendant client. The plaintiff's pre-verdict demand exceeded $400,000. For complete lists of trial and appellate decisions, see the biographies of Mark Ellis and Andrew Steinheimer. DEBT COLLECTION: ISSUES WITH TIME-BARRED DEBT Historically, neither a creditor, nor its agents (including its attorneys) owed any obligation during the collection process (prelitigation, or even after suit was filed) to advise a debtor that the debt being collected upon was beyond the statute of limitation – that is, the statute of limitations for suing on the debt had accrued and expired. This has changed with the adoption of the Fair Debt Collection Practices Act (FDCPA). Recent changes in Telephone Consumer Protection Act jurisprudence, including new interpretive orders from the FCC and recent court decisions that have clarified when prior express consent applies, when and how consent may be revoked, whether vicarious liability exists for a TCPA violation, the role of the Hobbs Act, and the meaning of what constitutes an automated telephone dialing system (“ATDS”).